Melaleuca plants are commonly known as ‘Tea Tree’, ‘Paper Bark Tree’ and ‘Honey Myrtles’ and with a range in the species of nearly 200 they come in forms from low growing (1m) to small to medium sized trees (30m). Many are garden worthy plants with good green foliage year round and some tall growing with masses of colorful flowers in summer. Others are suited as ground cover plants, M. incana nana being one such variety. It reaches around 1m in height and features small yellow flowers from spring into summer depending on the climate. Some species are grown commercially for the essential oils, Melaleuca alternifolia is the plant that tea tree oil comes from. Others are grown as windbreaks, hedges and as ornamental plants. Some such as Melaleuca flugens have attractive colourful flowers. With over 200 species they are related to Callistemon, however they naturally occur in low lying damp areas, often along slow moving streams in coastal situations. With such a wide ranging natural habitat from tropical Queensland to the Dry areas of Western Australia it is surprising that so many of these plants are adaptable to a range of conditions. 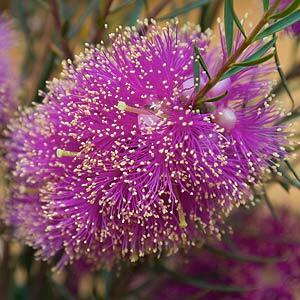 Generally speaking a moist soil and a sunny position are best for Melaleuca. They are a plant that can be pruned to shape. If pruning is carried out from an early stage garden plants can be trained to a nice bushy shape or a hedge. 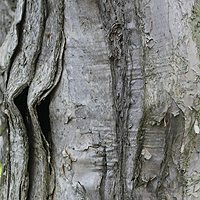 Many species respond to hard pruning as well and will recover from being cut right back. 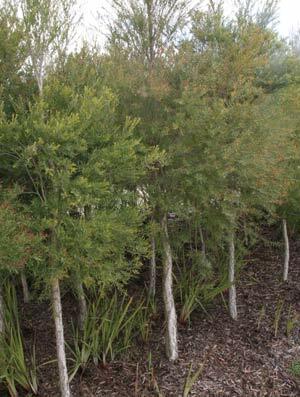 Although they generally require little fertilizer, Melaleuca plants can cope with a little slow release fertiliser once a years and seem to respond well. Having attractive foliage and nice flowers as well as being attractive to native birds Melaleuca are popular in native gardens. M. alternifolia – used for its essential oils, known as Tea Tree, and Narrow Leafed Paper Bark. M. diosmatifolia – also known as the ‘Rosey Paperbark’, purple flowers and from 2 -3 meters, a good garden plant that responds to light pruning from a young age. M. styphelioides or ‘Prickly-Paperbark’ is pictured right. M.viridifolia – A small tree with red flowers.